With the 7DRL HarvestRL done, even if it is really unbalanced, I'm remaking it and extending it in a way I wanted the game to be originally. I'm starting with UI changes, so that I can address some of the major complaints of the 7DRL version and improve accessibility. Once I get those changes complete, I can start working on mechanical changes (such as better monsters, more meaningful / less tedious farming, actual villagers, etc.). 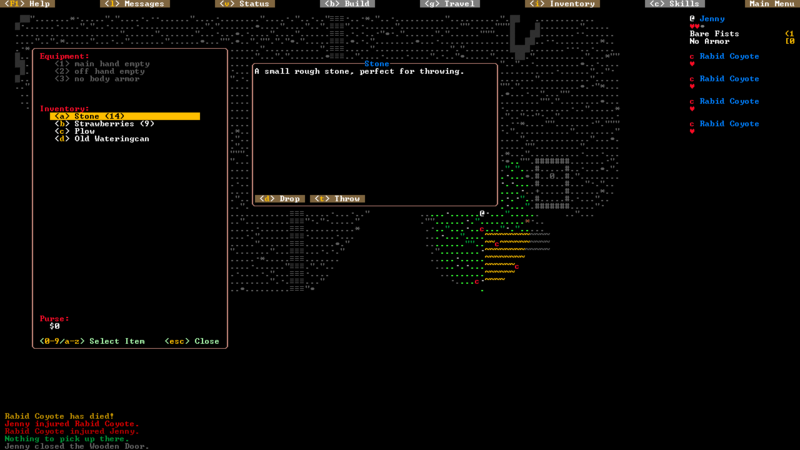 I don't have much to report at the moment except how the new Inventory screen looks/works. Those brown button-like things are clickable buttons, though I think the brown might be a bad color choice. Mouse targeting for throwing doesn't work yet; improving the targeting for ranged effects is next on the agenda. Thanks, it's fixed now. I'll make another post there soon once I get a development plan worked out. Although I think a feature list isn't particularly helpful, a feature list that is sorted in order of preference (with an estimated timeline) could be helpful and might actually be interesting for people other than myself. Especially now that the mouse stuff is done. ... of course I want to redo the UI again but I'm going to resist the urge. Otherwise, this game will languish like my other RL projects.